Iron Panel 42"Tall x 48" Wide x 1" Thick Foam Prop - Dino Rentos Studios, INC. This is a single Wrought Iron Panel. 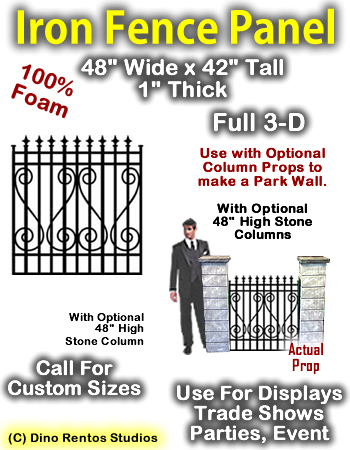 Use by itsself in other props or with the Stone Columns to build a fence. Perfect for Photographers, Trade Shows, Retail Displays, Stage and Theater and parties. See our complete set of Stone Columns and bush walls. Call us for quantity orders - We can ship freight and save alot of money for shipping.